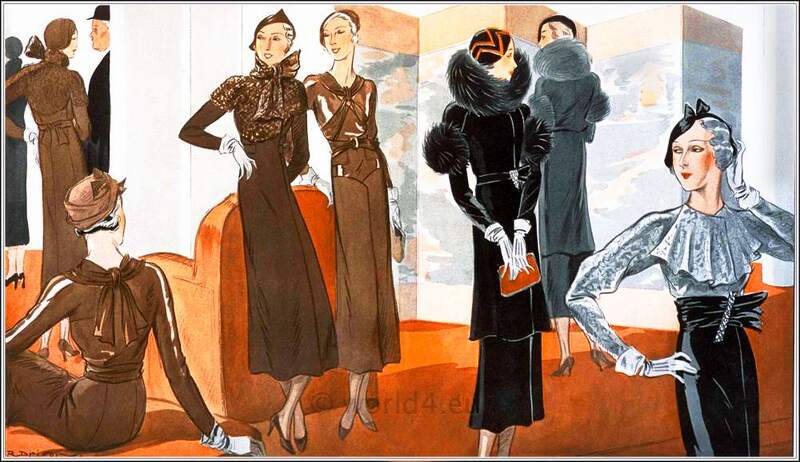 Contributions under the Category Art deco fashion. In most of the articles there is a link to the associated gallery. Short about Art deco period fashion: Art Deco style indicate the years between the 1920s to 1940s, the period between the two world wars. Characteristic of this epoch were the formal elegance of fashion, the exceptional quality of the materials and the subtle combination of colors with abstract motifs. In the fashion of the Art Deco style is also associated with the then revolutionary new fashion movement of the flapper or Charleston or Gibson Girls combined. This fashion style was like a initial spark to the feminism and women’s rights, a crucial step in the society anchored. Les créations parisiennes. La mode est un art. Editors: Maggy Rouff and Germaine Lecomte. Published in 1929. Haute couture costumes, spring season 1913.